Marian Esther Kempin ( nee’ Grimshaw), 94 of West Lafayette, IN formerly of Peoria IL and Kinston NC, went to be with her Lord and Savior on September 26, 2018. She was the daughter of Hiram W. Grimshaw and Wilhelmina L. Stuaan, born on July 21, 1924. She attended Loucks Grade School, Columbia Jr. High and graduated from Peoria Central High School. She was married to Reinhold A. Kempin on February 23, 1952, for 42 years. Surviving children are Diana C. Burchette (Randall) of Colonial Heights, VA, and Scott D. Kempin (Jane Keithley) of Evansville, IN. Grandchildren include: Kristina Johnson, Ryne Kempin (Jazmine Street), Drew Kempin and Kyle Kempin. Marian has several surviving nieces and nephews. She was preceded in death by her husband Reinhold (Reiny), parents, sister Judith Schneckenburger, and brother Marshall Grimshaw. She volunteered her time and talent at Trinity Lutheran Church and South Side Mission Peoria, IL, and Inter-Church Out Reach in Kinston, NC. 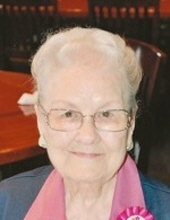 She was active in the Lutheran Women’s Missionary League for 52 years. She enjoyed fishing and bowling, with her husband, and cooking. Marian was devoted to her children, read her Bible daily and loved Bible Classes. Private graveside services are scheduled for Saturday at Springdale Cemetery, through Wilton Mortuary, Peoria IL. In lieu of flowers, memorial contributions may be made to Redeemer Lutheran Church, 510 Lindberg Ave, West Lafayette, IN, 47906, American Heart Association or American Diabetes Association. "Email Address" would like to share the life celebration of Marian E. Kempin. Click on the "link" to go to share a favorite memory or leave a condolence message for the family.